At Nishi Enterprise, we have enhanced technical skill and infrastructure to create some of the best castings in a number of different metals. We regularly manufacture and supply castings in a broad range of materials, such as Cast Iron, Cast Steel, Manganese, En Series, Ni-Hard, High Chrome as well as all kinds of non ferrous metals. Our experts can come up with castings with the weight of each piece ranging between 1 kg and 10 ton. Here at Nishi Enterprise, we excel at delivering castings that are customized to meet your specific needs. We can also supply you with castings that are exposed to heat treatments to ensure a longer life. Over the last few decades, we have worked with thousands of clients and have offered them some of the finest casting components for their industrial purposes. 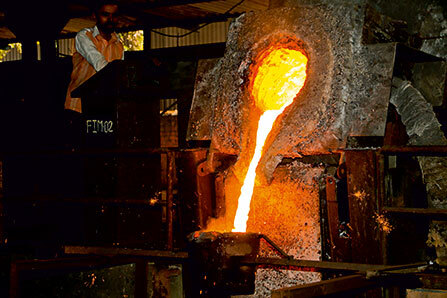 Since we always make use of advanced technique to work on the different kinds of raw materials, it enables us to produce top notch castings in bulk quantities. We only procure superior quality raw materials from the best sources so that the castings that we create deliver powerful performance to our customers. As a leading name in India when it comes to the manufacturing of various industrial components, we can offer both standard and custom casings to our customers. We not only offer our products for buyers in India but also in other parts of the world. Being one of the most prestigious manufacturers of castings in India, we always stick to the best industry practices when it comes to designing and producing these components. We always make use of environment friendly methods of production. All natural elements and raw materials are handled with careful precision. The extra care and attention put while making our products helps us to create castings which are eco-friendly and ideal for a broad range of functions.